Yes, I am a Cubs fan. So yes, there will be many GO CUBS pages, so there will be part, 3, 4, etc.... What makes that fun is that is a part of who we are. I get to document my son and his different stages of interest in Baseball. Sadly, it didn't last very long. But I have fun pictures that go with the memories. This was the big "sign writing" stage that my son was in. He was in 2nd grade. He knew how to write fairly well. He was so into his markers. He was always writing, drawing, coloring. I love that he decided to make a sign to take to the game. Why am I telling you this you ask? For Father's Day, we gave Dad tickets to the game, as well as a personalized brick that would be placed on the new walkway in front of Wrigley Field. We had received a letter with our copy of the brick, telling us how to find the one at Wrigley. I think I was as excited as they were about going to the game! I realized as I was working on this page that I am running out of baseball themed papers! 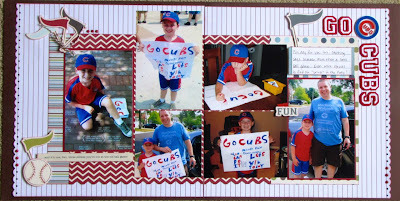 I started with a Creating Keepsakes sketch, grabbed what baseball stuff I could find, and just put the page together. I'm happy with the way it turned out. Regardless of the type of boy you have, I'm sure you have photos of them doing what makes them who they are. Grab them and come play along at About a Boy!